For me, Thanksgiving is all about the sides and these green beans are so good, they might steal the show. Barely cooked green beans are enveloped in a strip of bacon sprinkled with a bit of brown sugar then drizzled with garlic butter. Do I need to say more? When I made these in the test kitchen they vanished. Plan for more than 1 bundle per person as your guests will come back for more. This is Williams Sonoma’s top reader recipe and there is a reason why! The original recipe appears here. When I made them a second time, I used fresh garlic instead of garlic powder in the butter and a generous sprinkle of freshly ground pepper on the finished beans. Even better! To ease the frantic Thanksgiving meal preparation, you could precook the bacon, have the green beans trimmed and blanched and assembled on the baking sheet until ready to bake. Sprinkle the brown sugar and the garlic butter just before putting in the oven. Roast until the bacon is cooked through and browned, 20 to 25 minutes. Let stand for 3 to 5 minutes. Transfer the green bean bundles to a serving platter. 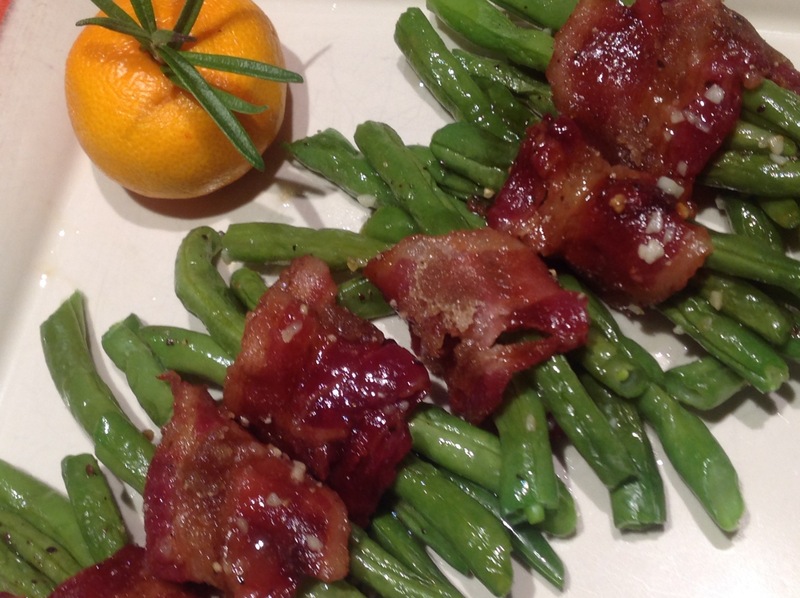 This entry was posted in Recipes and tagged Bacon, caramelized bacon, green bean bundles in bacon, green beans, haricots verts, Williams Sonoma green bean bundles with bacon by Johanne Lamarche. Bookmark the permalink. This is a Southern classic Johanne, I need to put this on our menu!! I had no idea Jenna. My family must be Southern at heart. They LOVED these! I like that these could be started a bit ahead of time. That always comes in handy when preparing a meal for a crowd. I definitely will use the fresh garlic, too. These look really good, and the presentation factor jumps WAY high! Your family will love these Alycia and I know you will give them a 5 star presentation! This is my kind of side any time of the year. 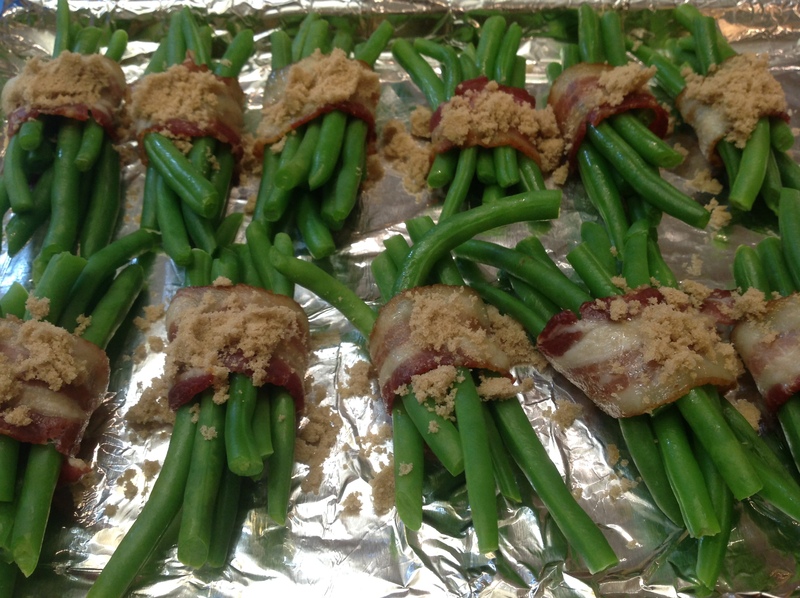 Bacon ,and caramelized at that, plus green beans – a favorite veggie – the Thanksgiving crowd are going to love these. I like the thin haricots verts and would be perfect with this recipe. This is a crowd pleaser for sure Judi! Merci Johanne pour la recette , je l ‘ai fait hier pour le souper excellent ! I do something like this in the spring with asparagus and prosciutto but this looks lo much better and so much more flavorful. A little heartier too – what a gorgeous side!